Which Types of Outdoor Lighting fixtures are available for your lighting needs? If you've been wondering what types of outdoor lighting fixtures are out there today, then you've come to the right place. Your knowledge of the available choices for outdoor lighting is the second most critical part of choosing the right fixture. Of course its pointless to know of every type of fixture available on the market today if you don't know how to use them. Let's look at what options you have when shopping for outdoor lighting and we'll separate them into easy to understand categories. 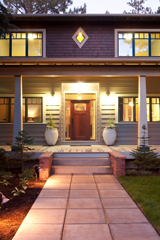 Although it may sound pretty simplistic there are two main categories of outdoor lighting. Uplighting, where the fixture is positioned down below while shining it's beam spread upward. Downlighting, where the fixture is positioned up above and shining it's beam spread downward. Either way, these types of outdoor lighting fixtures are each unique in their lighting ability and can give you an abundance of choices to choose from. Let's look at what uplighting options you have and how to use them from the ground up. The flexibility you have in choosing a mounting location for these fixtures makes them a great choice when selecting from outdoor landscape lighting options. Stake lights allow you to stick them into the ground and you're good to go. Its always a good idea to give the wires leading up to each stake light some extra slack in case you need to move your fixtures as your landscape changes. Installing uplighting in a high traffic area requires more thought since you'll need to think about human behavior, traffic movement, lighting glare, and fixture placement. A good option is outdoor recessed lighting. These can be positioned just about anywhere and they'll never become a tripping hazard. Drainage for is very important to maximize the life span of these types of outdoor lighting fixtures. Proper drainage will prevent these recessed lights from shorting out. The lamp housed inside these fixtures should be tilted away from people's eyes since it's light output could cause major glare for people walking by. HID lamps or lights used for commercial outdoor lighting applications requires that special care be taken to ensure you get the most out of them. Often these lights are housed in a relatively large fixture used to control the lamps light output. Since the housing is pretty large in comparison to low voltage lighting, keeping them out of the way in a very busy area may become a challenge. It's also important to consider how bright these lights can be therefore potentially causing major glare. Planning ahead of time is critical to getting the best results from your ground mounted HID lamps. Outdoor Wall Mounted Lighting is a convenient method of downlighting that can be mounted on just about any wall type. Wall mounted lighting styles vary based on the architectural style you want to compliment. Some of these wall mounted lights provide a secondary benefit. For example, up and down wall sconces wash your walls with light spreading and exposing the ceiling above and ground below them. Outdoor flood lighting helps you spread light over a relatively large space without the need for planning an intricate outdoor lighting design. While flood lighting is excellent at spreading light over a large area, its weakness lies in providing very concentrated or precise outdoor lighting. For example, flood lighting wouldn't do well for outdoor kitchen lighting because its broad beam spread casts annoying shadows making it hard to perform detailed tasks outdoors. It also spreads light onto everything around it, eliminating the option for you to focus people's attention to specific details of your landscape's design through strategically placed lighting fixtures. Focusing attention to outdoor path lighting lets people know exactly where you want them to go. Path lighting gives people a feeling of confidence when walking. People like the idea that they can actually see the surface below their feet and don't have to worry about a tripping hazard. Subconsciously people tend to feel more comfortable approaching an outdoor space when they feel like they're guided. Displaying your landscape can be much more interesting with moon lighting. Moon lighting imitates the moon's lumination on your landscape and is often achieved through outdoor tree lighting. These types of outdoor lighting fixtures are positioned within your tree's canopy, spreading light down below. What makes this method of outdoor lighting unique is that the tree's branches and canopy will interfere with your lights beam spread, resulting in a very natural shadow effect that mimic's the moons subtle glow.